You have never heard of powered paragliding or paramotoring? Well, if ever wanted to fly on your own then this is the most affordable solution for most people. It allows you to own an aircraft that can be stored in your garage, basement or room closet, does not require private pilot license and airport to fly from and best of all you can haul it around in your car or truck. As opposed to traditional non motorized paragliders you can launch from level ground under your own power, flying as you please. Powered paraglider allows you to be as close to a bird as it is humanly possible. The equipment that you needed is minimal with respect to aviation standards. The three main items being the paraglider, also called the wing or glider, and the paramotor, sometimes called backpack engine and rescue parachute. The rest of the equipment consists mainly of communication gear. The training needed to start flying is also minimal. The industry recommendation is 6 - 8 days of personalized training, with more being better. You can never be too prepared. There have been people that have soloed on their first day, but this is not recommended as you have little to gain and a lot to lose. Safety is of utmost importance. Despite the relatively low risk involved with powered paragliding there still remains the possibility of serious injury if a pilot doesn't properly prepare and exercise good judgment. Preparation and proper training go a long way towards a pilot's well being as well as enjoyment. Piloting one of these ultra lights gives a person excellent opportunities to capture breathtaking aerial views because you are not stuck behind the window of an airplane, you are out in the open experiencing the skies like a bird! 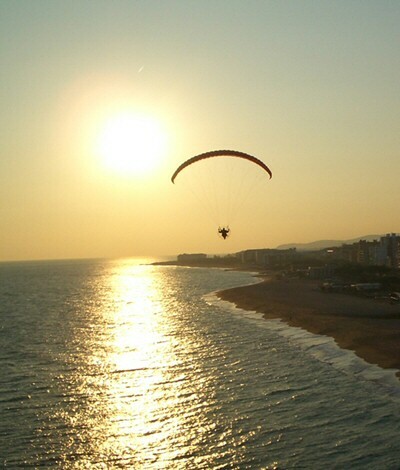 Barcelona : Barcelona (Spain) is an ideal location in Europe in order to take a course in paramotoring. The perfect all year round weather, makes it an ideal place.